How much are risk and benefit perceived on thyroid cancer screening test? A cancer screening test is given to people who have no symptom. The people are screened to find whether they have cancers. The test brings risks and benefits to the people. The biggest benefit of a cancer screening test is a possible reduction of mortality risk of the cancer by earlier detection and treatment of the cancer. On the other hand, major risks of a cancer screening test are “overdiagnosis” and an inadequate accuracy of the test. “Overdiagnosis” is to find a cancer that have never causes death during expected lifetime. The progress of the cancer is arrested or slow. The overdiagnosis sometimes leads to unnecessary medical treatment such as surgical operation. Many of small thyroid cancer, which is found from people with no symptom, are often found after they die due to other causes. That cancer is not likely to cause a symptom in the expected lifetime. Fukushima Prefecture has been conducting a thyroid cancer ultrasonic screening test for people living in Fukushima who aged 18 or younger at the accident of Fukushima Dai-ichi Nuclear Power Plant. The thyroid cancer ultrasonic test screens people with no symptom to find whether they have thyroid cancers. Risk and benefit should be considered for this test, same as other cancer screening tests. However, a few people recognize risk and benefit of thyroid cancer screening test according to the survey by researchers of Fukushima Medical University in 2018. Dr. Sanae Midorikawa reported a questionnaire survey result, obtained at explanatory meetings among residents, at International Symposium in Fukushima City on 15th January 2019. The explanatory meetings were held at the 16 venues from May to November 2018. Participants of the meetings were mainly for parents of children and teachers. The 389 participants (13.6% for men; 72.2% for women) responded some questions before the meeting. 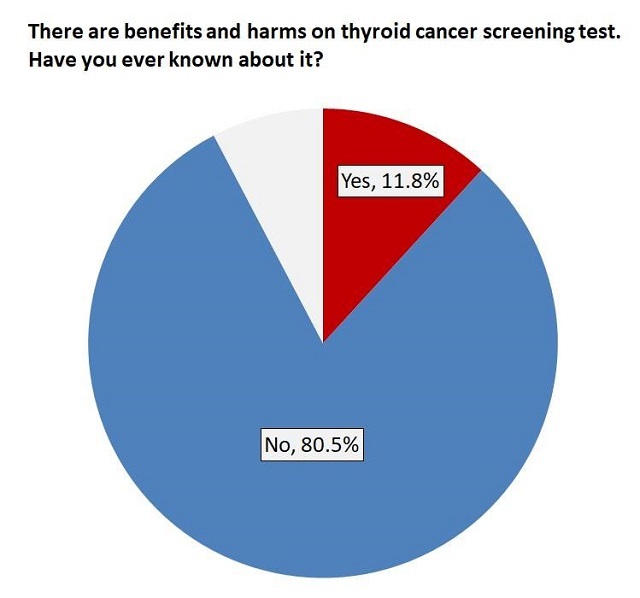 One of the questions was “There are benefits and harms on thyroid cancer screening test. Have you ever known about it?”. 11.8% of the participants answered “Yes” for the question and 80.5% of that answered “No”. There was a big difference between two. Another survey was conducted by Fukushima Medical University, in which students of two universities outside of Fukushima responded the similar question. In the survey, 23.9% of the students answered “Yes” and 71.8% answered “No”. A cancer screening test that targets at children and young people, such as the thyroid cancer screening test in Fukushima, possibly cause overdiagnosis risk. The examples of detriment brought by the overdiagnosis are long-term psychological distress and rejection of insurance. Therefore, it will be a big issue that many people don’t know the risks accompanied with the screening test in the current situation. Fukushima Prefecture regularly convenes Prefectural Oversight Committee Meeting for Fukushima Health Management Survey and the working group on thyroid examination. The committee members mainly consist of medical doctors and have been discussing the better way of explanations and informed consents for the subjects. Hereafter explanations on risk associated with the thyroid cancer screening test will be given.